Nope, that doesn't seem to fix it. 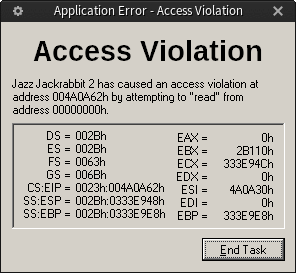 Apparently it isn't my Jazz2.exe file either, seeing as it worked when I sent it to Sir Ementaler. I'm going to write up a guide on how to make keyboard 1 controls work nicely with mouse aim as well as default aim soon, so you don't have to keep configuring/have awkward control. Though I found something abnormal when playing plusPalettes. myPal.load("plusPalettes.j2l");  //any file is allowed! and will give you awful results! Snooze/Obi: Are you getting the AV at the same addresses (Xh at Yh) as juan pablo? 1.23, when I try to play any level. Windows 8.1. Last edited by Stijn; Oct 20, 2013 at 09:14 AM. edit: ok I made a mistake. my plus indeed works for 1.23 on my other computer, but TSF still crashes. Ill get a screen of the error in a second. And also, on my laptop, TSF wont even start properly (doesnt matter if its plussed or not) and 1.23 plus crashes with an AV, like TSF on my computer. One request: please have an configuration .ini for changing the controls during mousemode! I can imagine people want to play with the right mouse click or mouse wheel(weapon select perhaps or scrolling through weapons) and W,A,S,D for movement, W or space being the jump button. I think it's so groundbreaking it's not weird to have a set of different controls during this mode. I second this! Had to change all controls, and I use W for run and space for jump. Cycling through ammo with mousewheel would be awesome. Right mouse button should be assignable tool. Last edited by djazz; Oct 20, 2013 at 09:30 AM. The crashes I was experiencing have completely stopped (in 1.23 anyway, haven't checked TSF yet). This is with default settings. Also I can brag about being able to use the default controls in mouse mode, because I'm left-handed. Totally worth being unable to write in pen. I found a bug! If you spectate NO ONE and unspectate, you will get kicked for hacking, and eventually, banned. Seems to only happen in this level... hmm.. Here's a brief guide I wrote on adjusting controls for both mouse and default aim. It's the best that can be done at the moment. Spacebar cannot be used for jump unless you changed your shoot button for default shooting. Spacebar cannot be used for jump unless you changed your shoot button for default shooting. I'd recommend W for Jump. Well done!I'd recommend W for Jump. I use F for jump in mouse mode, though I might try W for jump if it feels less strange for me. My statement about spacebar was actually referring to Faw. This is a debug build for those who are crashing when they try to load levels. If you're not having this problem, you have no good reason to download this, because it's slower, it's twice as big, and it doesn't work with some support programs. The only thing it's good for is providing more helpful addresses in Access Violations (and occasionally even more detailed errors, but that's rare). If you're getting the instacrash issue, please post screenshots of AVs you get using this build, not the main one, and hopefully I'll be able to track down the issue. Thank you! I'll replace the Plus code addresses in the AV's with module addresses (or minimally add Plus's module address) as soon as I get the time to work on Plus again. Will save us this hassle for the next release. In new plus, there is a bug with warping after taking a carrot, at the moment the glow disappears, player's position gets bumped ~2 tiles, stopping their movement, and sometimes going into walls. That's been happening for everyone in servers running the latest release of plus, even if clients use old plus. Tracking down the crashing thing is proving more difficult than I expected... snooze, I think you're the only person reporting it happening in TSF? Can you confirm that it happens in TSF specifically when trying to load a level, just like in 1.23? EDIT: I just came up to something very frustrating what happens very often. While spectating someone, if he has a PU, the ammo he picks up shows as non PUed sometimes. Hope it's fixed. I spectated someone in a server where I am not sure a new plus is installed and it worked fine. I'm having trouble reproducing this. Can you break it down a little more? Edit: Also for Show Max Health, make the hearts darker. They could be pitch-black like in 8-bit. Would that be better? Does this occur with +1 carrots, or only with full energy carrots? Under normal circumstances it never crashed for me in both 1.23 and TSF. Only some crashes while playing on a server using older Plus, but that's to be expected I guess. Also, was it intended that Psych2.j2l now has the Tunnel textured bg, or is this a side effect/easter egg? Side effect. Apparently, Psych2 has always used option #2 for the background, and since there were no other options than Warp Horizon for 15 years, nobody noticed. Not even Epic did, since Psych3 and Share2 use it too! Yes, my TSF crashes with an AV when loading any level. Might aswell share my AVs I get when changing level/going to main menu sometimes on Linux. 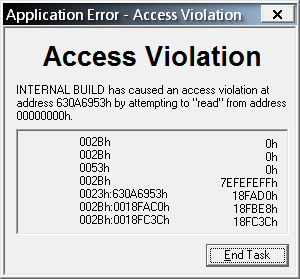 Unhandled exception: page fault on read access to 0x00000000 in 32-bit code (0x004a0a62). Not much difference between regular and debug..
FWIW, I don't have this problem when running JJ2 on Windows 7. So it may be worth looking into whether this is a Windows 8-specific thing. On the other hand it's also a different PC, so I can't say for sure whether the OS is the deciding factor here. 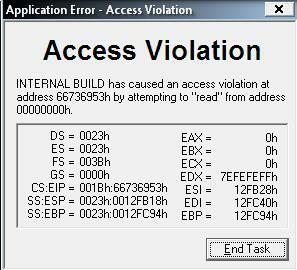 I'm running Windows 7, and juan was running XP, so I think it's unlikely that it's an 8-specific issue. whether the OS is the deciding factor here. Probably not. I'm currently using Windows 8.1 too and haven't ran into problems. On a side note, the broken DirectDraw Hardware Acceleration from Windows 8 is still there in 8.1, so you still have to turn DDraw hardware accel off in your DirectX settings if you want to play fullscreen without trouble. And I found a different little glitch btw. When you join a server with a timelimit set, then disconnect, and start a local singleplayer game, the timelimit from the previous match will still be visible and counting to zero without doing anything gameplay-wise. It doesn't crash when it hits zero or something, just a visual thing. Easy to fix I guess. And I was running Windows Vista! Do you crash when loading a level with no animated tiles? Do you crash when loading a level with no tiles whatsoever? Do you crash when loading a level with no music file? Do you crash when loading a level if you replace bass.dll with the one from the last release? Also, what does jazz2.log have to say? Well, that sort of proves it is not an OS thing. Yes, both full and +1. Replacing bass.dll doesn't seem to make any difference. By the way, seekers don't always go through one ways properly in the new plus. EDIT: Seems to be a problem with thin masks, something like less than 16 pixels cause problems from what I saw. Last edited by Superjazz; Oct 21, 2013 at 12:40 PM. I would also like to point out that powered up bouncer ammo when shot up won't go that high as they used to do in the previous versions. EDIT: When you enter a warp via a ceilinged spring, the 'warp frames' are way shorter than entering a warp in a normal way. Their range is about 1 tile shorter yeah, not so drastical difference in most maps, but in some such as gw it can matter. Any estimation about how soon a possible hotfix could be done? Vivando: Since we don't know what's making the game completely unplayable, no, no estimation. Well, there are maps specially made for the long range of the bouncer powerup. I Experience crashes every time on Single player level, but after joining on a server Single Player has been started to working.